Trends in wall cladding systems are changing rapidly as manufacturers continue to innovate with new technologies, materials, and green building methods. Intelligent-based systems provide dramatic artistic effects, and address environmental goals including protective layers from air, wind, water, and heat gain. M.F. Murray Companies is proud to represent the most highly regarded cladding system companies in the world: Trespa and Cladding Corp. Our in-depth knowledge of their products and technical know-how enables us to meet all of your cladding design needs using a wide range of materials: Terra Cotta, Fiber, Concrete, Porcelain Ceramic Tile, and High Pressure HPO Resin Panels. We are affiliated with a team of qualified licensed installers who are financially strong. You can rely on them to meet the highest quality and safety standards. Trespa is an international manufuaturer of high performance cladding systems and interior partitions for over 50 years. Download a pdf of recent projects. Focus is product development, combining quality manufacturing technologies with state-of the-art solutions for exterior and interior building applications. The flagship product line is Trespa Meteon, designed to inspire, perform, and endure. The first name in Rainscreen. Their goal is to "master the art and science proper drained and back-ventilated rainscreen cladding design." 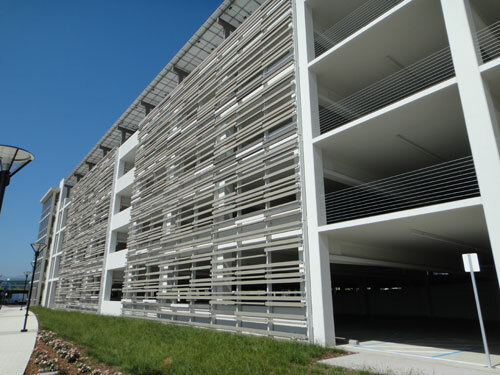 Take a holistic approach to rainscreen design; they focus on the entire exterior building envelope of the wall assembly. Their latest innovation, the System 5 is a fully integrated rainscreen system that encompases the Five Principles of an effectively drained and back-ventilated rainscreen assembly. White paper: "5 Principles of Rainscreen"
© M.F. Murray Companies, Inc. All rights reserved.